Following on from the sprout top recipe, this is another side dish I put together for a recent Borough Market post. It’d be a good option on Christmas day (see my thoughts on what and how many festive sides). But, to be honest, would work for many other meals too, and across much of the year. Indeed, I’m afraid it heralds many months worth of noise about side dishes. 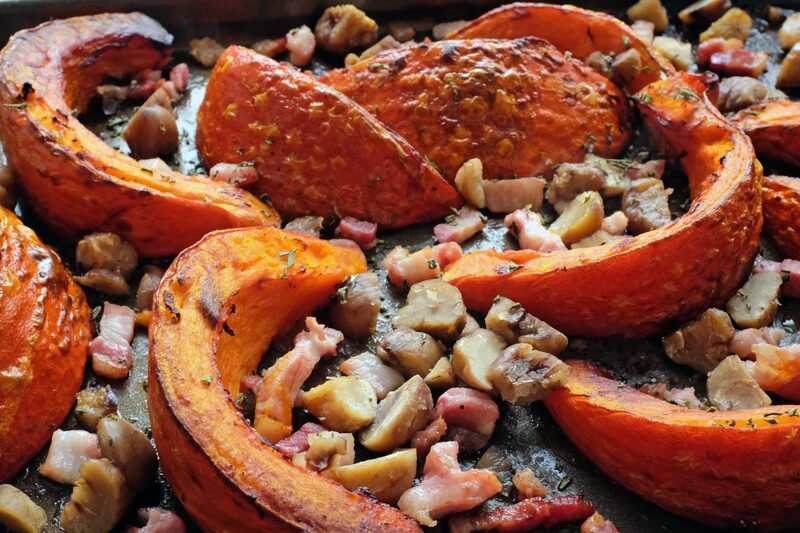 This method and combination of flavours will work perfectly well with butternut squash. But do try one of the many varieties of winter squash if you can. I made this with an onion squash — the compact, sense orange spherical ones, also known as ‘red kuri’ — and I was really pleased with the savoury flavour and meaty yet creamy flesh. Delica (kabocha) would be cracking too. As always, the better the lardons, the better the result. Same with the chestnuts. Any of the market butchers will sell you excellent smoked lardons. Pre-heat the oven to 220C fan. Cut in half, scoop the seeds out. Cut each into 4-5 wide wedges. Put on a shallow baking tray. Drizzle the oil over the top and mix with your hands to ensure all the squash is glossy. Cook in the top of the hot oven for fifteen minutes. In the meantime, roughly quarter the chestnuts, strip the leaves from the rosemary and finely chop. Once the squash has been cooking for fifteen minutes, remove from the oven and carefully flip the wedges onto a different edge. Distribute the lardons in the baking tray and return to the oven for ten minutes more. Then, after a total of 25 minutes of cooking, add the chestnuts and sprinkle the rosemary over the top of the squash. Return to the oven and cook for 5-10 minutes more, removing when the bacon is golden and crips, the squash tender of flesh, and caramelised and blistered at the edges.